In Fantastic Voyage, a classic sci-fi film, a submarine was shrunk to nanoscale size and injected into a patient, who was ultimately saved by the submarine’s nanoscale crewmembers, who used a laser to obliterate a dangerous blood clot. Now, curiously, elements of that story are being replayed in real life, albeit in mice that are in need of chemotherapy. Also, the chemotherapy isn’t delivered by anything as flashy as a miniaturized submarine. Instead, the carriers are porphyrin-phospholipid liposomes, which are less formally known as nanoballoons. While the nanoballoons lack the sleek lines of the Proteus (the intrepid craft in the film), they have their own charms. 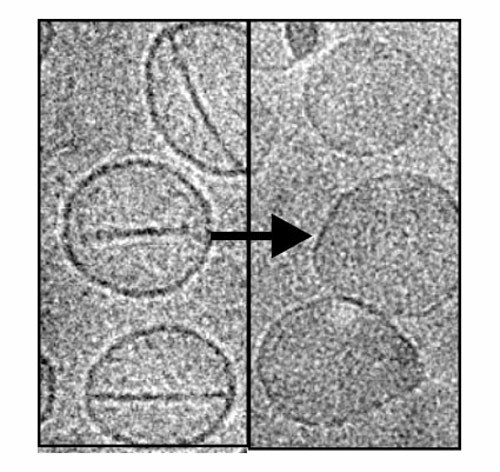 They are, essentially, liposomes, which are artificial vesicles—bi-lipid-walled, sphere-shaped containers. Various kinds of liposomes have been developed to carry and deliver drugs, but they have had only mixed success. They struggle with physiological barriers, and they don’t always release their cargo when and where it is needed. To overcome these limitations, scientists have developed a new kind of liposome. As indicated above, it incorporates a porphyrin-phospholipid, or PoP. PoP liposomes can be permeabilized by irradiation with near-infrared light. More to the point, when PoP liposomes are struck by a laser, they pop open—on demand—and release their cargo, which may consist of fluorophores, antibiotics, or chemotherapeutics. What's more, as soon as the laser is turned off, the PoP liposomes close, taking in proteins and molecules that might induce cancer growth. The PoP liposome’s developers foresee doctors using them to collect such tell-tale debris, which could be analyzed once the PoP liposomes are retrieved via blood draws or biopsies. Dr. Lovell intends to continue fundamental studies to better understand why the treatment works so well in destroying tumors in mice, and to optimize the process. Human trials could start within five years, he said.